Whip out the silverware and throw down a nice table cloth for Gourmet Scavenger, the new continent hopping electronica compilation from Australia’s pioneering Omelette Records. There’s a lot of electronic music compilations being unceremoniously served the world over. So thank the sonic kitchen gods for Gourmet Scavenger, a fresh and scrumptious compilation of international electronica to whet appetites and quell the most ravenous of hungers. Omelette’s award winning producer Spoonbill (Jim Moynihan) has been busy forging alliances with some of the world’s most innovative producers in festival food courts and gritty sound kitchens the world over, and now offers 15 brand new tracks you’ve never tasted in your whole life. Unheard and ear snappingly fresh. A selection of lobe smacking dishes, Scavenger’s all natural ingredients range from downtempo electronica to folktronica, glitchhop to leftfield hip hop, brokenbeat to jazz groove, plus a few spices you’ll have a hard time putting your finger on. 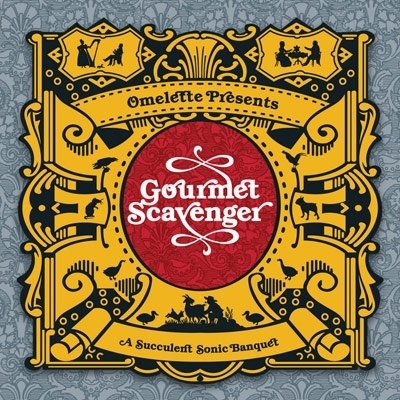 Plucking treats from Australia’s shores, to those of America, UK, Austria and France, Gourmet Scavenger offers one of those rare compilations that appeals because it’s so consistently good and yet remains so onsistently inventive. This marks an important milestone for Omelette, who launched with the debut release of Spoonbill’s Megafauna 3 years ago. Noted for its inventive and distinctive sounds, Omelette refreshed our desires for free range grooves with the release of Spoonbill’s second album Nestegg in 2007. Now, Omelette serves succulent works from further purveyors of fine, innovative sound waves. From the smokey wood fired beats of Wax Tailor to the creamy sounds of Hermitude, from the light crunch of Lotek’s biscuity batter, to the sharp, heady bite of Frank Riggio, Scavenger sets out to offer that most noble of menus: the Various Artists album that enlightens as much as it satisfies. No boring white beats, no Mono Soundium Glutamates, no artificial loop preservatives, just pure, cutting edge tunes from around the globe. The result: a gourmet banquet of nourishing sounds, made with only the very best ingredients by rising underground master chefs in their absolute element. Be you with nothing but a grumbling desire to fill the hole or one possessing of a more discerning palette, this is a 16 course meal that will leave you satiated and yet happily hungry for more. Perhaps seconds might not be out of the question? Hailed from France - Wax Tailor and Frank Riggio; From Austria - Raffael Francis; From the US - VibeSquaD; from the UK - Lotek (Ninja Tune/Big Dadda) and from Australia; Spoonbill, Hermitude, Monkeymarc (Combat Wombat), Soup (Miso), Eden Altman, Welcome Dear Friend (Velure), Alpha Channel, Sensient (Zenon Records), Niceface and the Sunwrae Ensemble.